Home » Vapur ~ A Collapsable, Rollable, BPA Free Water Bottle! I usually try and carry a water bottle with me wherever I go, but every now and then I forget and find myself running errands wishing for a drink of water. 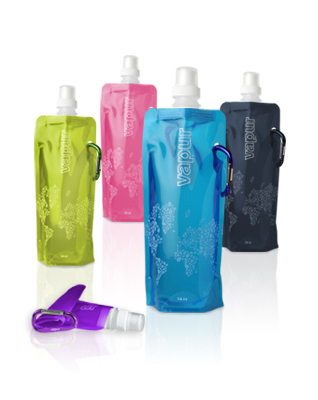 Wouldn’t it be great to have a water bottle that folds up and fits in a purse, car glove compartment or diaper bag? That way I could have a spare with me at all times. Vapur has created just that sort of water bottle! Great for just about any situation; running around town, a hike with the family, traveling or anywhere else you might need a handy water bottle. What makes the Vapur so different, is that while it stands when full, when it is empty it collapses down and fits into places a rigid water bottle couldn’t dream of! Made from a durable BPA-free polymer, Vapur bottles($15/2) are designed for everyday use and cleaning. The inside of the bottle is odorless, tasteless and stain-resistant. Vapur can be cleaned in the dishwasher and then air-dried, making cleaning easy and convenient. They bottles can even be frozen, making them the ideal bottle to take on long journeys! Not only is the reusable Vapur bottle a more sustainable option than plastic disposable bottles, but even shipping the new bottles is a more environmentally friendly than shipping other rigid reusable bottles. As Vapur bottles are flat when they are shipped, they require 90% less space than rigid bottles. For every 9 trucks carrying stainless steel or comparable bottles, only 1 truck is needed to carry the same number of Vapur bottles!